Investments in legacy industrial networks require a migration path to optimize return, while not missing out on performance enhancements from new technologies. A robust, well-executed physical layer is foundational to this asset continuing to deliver value. This is part two of a report started in IEB's September issue. NETWORK INFRASTRUCTURE IS ONE of the most vital yet undervalued business assets. This is the second part of a discussion started in the September 2018 issue of the Industrial Ethernet Book, starting on page seven. This series discusses essential knowledge and tactics in current, near future, and distant future time domains that guide network plans. It suggests resources and strategies to assist in the design, implement, operation, and maintain phases of a network′s lifecycle. Networks continue to evolve over time. Plotting the evolutionary path for the business network requires insight into future trends and possibilities. This section offers insight via identification and discussion of important technologies. The time domain for these technologies is within the next two years. PoE power transmission example circuit. Power over Ethernet (PoE) is an Ethernet-compatible technology created to enable Voice over IP (VoiP) telephony. DC power, at a nominal voltage of 48 VDC, is carried on one or more pairs in the Ethernet cable along with the transmitted signal. PoE-powered devices (PD) negotiate with the power source (e.g., PSE, typically a network switch) to ensure appropriate power is delivered. Businesses soon realized the potential of network supplied power. PoE now powers IP cameras, wireless access points, badge readers and access gateways, and office lighting. Today, PoE in industrial networks performs identical tasks to those it performs in enterprise networks including powering shop floor phones, wireless access points, and IP cameras. PoE holds a bright future as the standards community expands its capabilities. PoE is a key technology for the future of industrial networks because, with the advent of IEEE 802.3bt due to be published in early 2018, conspicuous amounts of power can be delivered along the Ethernet connection to a device. With 71 W available at the end of an Ethernet cable, device manufacturers can be very creative. This "one wire ideal" allows device power and communications in a single connection, simplifying all phases of the device life cycle. In doing so, PoE alters the DC power infrastructure of control systems. Legacy protocols are serial communications to the device at a very modest data rate. No device power is delivered by the connection. Therefore, local DC power supplies are required near the device to meet its power requirements. Behind the DC power supply are many AC components (e.g., transformer, connection wires, circuit protection, etc.) to convert machine mains power to a usable input to the DC power supply. When this supporting infrastructure can be eliminated, control system DC power infrastructure is simplified and costs become lower. PoE negotiates with the device at start-up to determine the appropriate power level to deliver. There is no need for pre-configuration of each circuit in a standards-compliant installation. Additionally, since device power is controlled by PoE-enabled ports in the switch above it, toggling device power can be done via network switch commands, simplifying service procedures. PoE should figure prominently in network installs to simplify powering needed by devices like cameras and wireless access ports. The transformative effect on the DC power infrastructure, while quite feasible, will take longer to become a reality. Work is underway in IEEE 802.3 to create standards for Single Pair Ethernet (SPE). 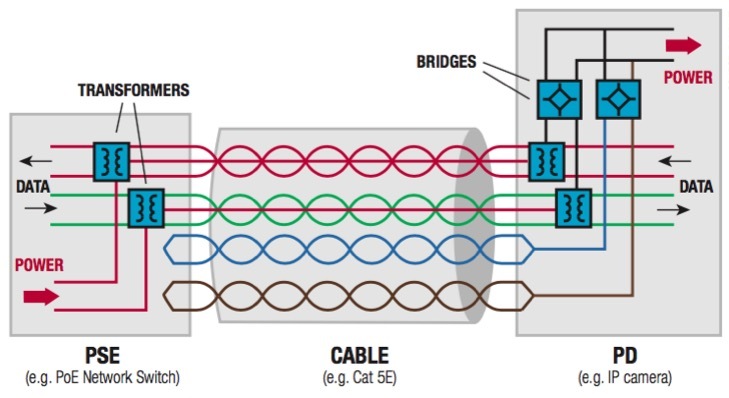 Many variants are proposed from short reach (15 to 40m at 1 Gb/s transmission speed) to extreme lengths (up to a kilometer at 10 Mb/s transmission speed), all over a shielded twisted pair cable. For industrial network applications, the variant to watch is IEEE 802.3cg, the 1km at 10 Mb/s variant. All variants of SPE are considering a methodology for power delivery like PoE called Power over Data Line (PoDL), IEEE P802.3bu. The "front runner" SPE standard is IEEE P802.3cg. This standard is in Task Force now with an estimated completion date in 2019. Single pair Ethernet will rise to prominence by taking Ethernet to the edge of industrial networks. Device manufacturers and network switch manufacturers are closely monitoring and contributing to the creation of IEEE standards that enable this future concept. Power over Data Line (PoDL) is governed by IEEE standard 802.3bu. The PoDL acronym is frequently pronounced "poodle" in conversation. It represents a necessary adaptation of PoE. A reasonable question is "why can′t we just use PoE on SPE?" The reason is PoE requires at least two pairs to work. This is because there is an electrical connection between pair center taps. Since SPE has only one pair, the PoE circuit (above) does not work. However, a simpler circuit with a lowpass/highpass bandsplitting filter network works with SPE. Using PoDL Class 8 and Class 9, PD power can be 30 W or 50 W respectively at 100m. New classes are required to accommodate the expected higher loop resistance of 1000m links seen in 802.3cg. PoDL and SPE go hand in hand as technologies to watch and include in legacy protocol migration plans. Wireless sensor networks are gaining popularity as businesses seek solutions that improve decision speed and quality. Wireless networks can be implemented quickly, speeding the availability of additional knowledge to achieve these goals. Speed and reliability do not yet perform like wired connections. Critical control connections will remain wired for the foreseeable future. However, wireless connections provide a fast and cost effective means to collect additional data to propel analytics efforts, study new facets of an existing process, etc. There are many wireless sensor networks worthy of consideration but two stand out for industrial applications. These are Wireless Mesh and LPWAN. Most wireless mesh networks used for wireless sensor applications are based on IEEE 802.15.4. This is the technical standard which defines the operation of low-rate wireless personal area networks (LR-WPANs). Wireless mesh networks have a unique feature that makes them a provocative choice for industrial data collection; they are self-healing. 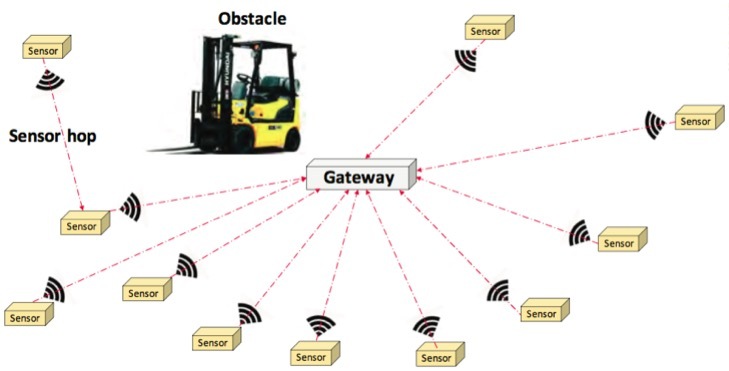 If a wireless sensing node is blocked from communicating directly with the sensor gateway, it will "hop" to an adjacent node to get back to the gateway. This feature is superb for industrial applications given the dynamic environment with material handling equipment and other large metallic structures often in motion. For example, the chances of a forklift mast blocking transmission at some point in the day is easily an "even odds" bet. Low Power Wide Area Network (LPWAN) is a technology worthy of note for industrial applications. LPWAN protocols are well-suited for use in industrial settings. These networks are nominally 900 MHz, a frequency range that performs well in highly metallic environments. LoRaWAN is intended for wireless battery-operated nodes in a regional, national, or global network. It targets key requirements needed for the Internet of Things (IoT) like low data rate, low cost and long battery life while delivering vital features such as secure bidirectional communication, location, and mobility services. In Europe, LoRaWAN operates in the 868 MHz band. North American LoRaWAN installations use the 915 MHz band. Class A - battery powered node. Class A operation optimizes communications to conserve battery power at the node. Class C devices have nearly continuously open receive windows reducing latency to its practical minimum LoRaWAN presents performance advantages for wireless sensing networks and is already gaining popularity for many IoT applications. This is a wireless network to watch and include in your future network planning. Industrial network evolution includes a strong influence of better IT/OT collaboration. As these two very capable groups act in concert to improve business outcomes, some advanced IT practices will find their way into industrial networks. These are Time Sensitive Networking (TSN) and Software Defined Networks (SDN). TSN gets a lot of attention from automation experts due in part to the increased interest in the Industrial Internet of Things (IIoT). Some of the data collected by IIoT sensor networks is not inherently time sensitive. However, some data is mission critical and time sensitive and must be shared with strict latency and reliability requirements. Further, all application data is enriched by adding accurate time context as it allows correlation and analytics to excel. Therefore, TSN is an important technology both within the control loop and outside the loop in IIoT applications. Security: TSN embraces top-tier Ethernet security provisions; Segmentation, performance protection, and temporal composability add multiple levels of defense to the security framework. Interoperability: TSN integrates existing brownfield applications and standard IT traffic by using standard Ethernet components; TSN inherits many existing Ethernet features like HTTP interfaces and web services; These features enable remote diagnostics, remote visualization, and repair capabilities common to IIoT systems. Latency and Synchronization: TSN prioritizes low-latency communications to provide fast response and closed loop control applications; It can achieve deterministic transfer times on the order of tens of microseconds and time synchronization between nodes down to tens of nanoseconds; TSN provides automated configurations for high reliability data paths where packets are duplicated and merged to provide lossless path redundancy; In doing so, TSN ensures reliable delivery of time sensitive traffic. TSN provides network designers with tools to ensure that critical traffic is received in a timely and reliable manner. It also frees up congestion to allow non-critical traffic to be converged onto the network and move as "best effort" traffic. This is an essential distinction in that almost all traffic is best effort. Wire speed and limiting traffic to only critical message streams is used to make the network function correctly. IEEE 802 has united several domain experts under the auspices to 802.1 to create a suite of TSN specifications that are without equal. The group has led application needs from audio/visual, automotive, industrial automation, and consumer realms in creating these specifications. Software Defined Networking (SDN) is an approach to computer networking that allows network administrators to manage network services through abstraction of lower level functionality. The current state of industrial networks is illustrated in the figure on the bottom of page 26. The robotics/welding cell, conveyor and error proofing solutions all require automation to function and connections to the industrial network. Along the top of diagram are the domain expertise groups that design and specify the functional needs for each solution. The control engineers (OT staff) must translate the design and functional needs into an automation system and industrial network solution. These staffs are often quite modest so companies engage 3rd party experts to attempt to perform in a timely fashion. Once in place, the network and automation must be operated, managed, and maintained. A chilling statement from a Gartner blog post crystallizes the gravity of those functions. "... 80% of unplanned outages impacting mission-critical services will be caused by people and process issues and more than 50% of those outages will be caused by change/configuration/release integration and hand off issues." Traditional network design and maintenance practices tend to reinforce the problem. Significant time and planning are expended. Specialized domain expertise is required for each solution, both from a process and a networking standpoint. Unique manual configurations must be made for each network node. And due to pressing schedules and business priorities, change management and record keeping are often lacking. Illustration of Device management using Software Defined Networking (SDN). Control plane functionality is transferred to the SDN controller which provides control plane instruction sets to the subordinate devices. A graphical representation of device management that while there is not literally a local laptop connection in all cases, traditionally engineers address and configure one device at a time until the whole network is configured. This is a laborious and potentially error prone method in addition to being very time intensive. A simplified view of device management (above) using SDN shows how network switches and other compatible network devices abstract their control plane. The control plane functionality is transferred to a device called an SDN controller which provides control plane instruction sets to the subordinate devices. 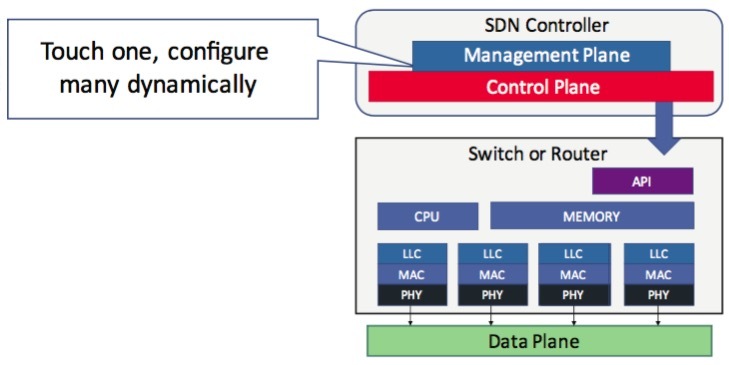 The SDN controller also contains management plane functionality. Therefore, a centralized controller handles monitoring, remediation, device behavior, and characteristics all from a central location. This architecture allows companies to create reusable configurations that can be replicated throughout multiple nodes using tested applications. Further extending the concept, it provides access to programmatically modify network nodes from the SDN controller. This functional change creates enormous benefits across the network. SDN simplifies the configuration and implementation of architectures by creating reusable configurations and designs that improve performance. The simplified SDN also improves corporate margins because plants do not need to rely on network specialists on the factory floor, thus lowering personnel costs, improving implementation time, and reducing troubleshooting and repair costs. Machine design is another area that must be addressed differently. When machine builders construct a solution, the individual components used for the machine are not often questioned. However, connecting the machine to the existing programmable automation controller (PAC) can be a challenge when Ethernet is not used and standards are not followed. Some machine builders leverage technology that is so disruptive that redesigns are required to some of those systems. To address this situation, it is critical for manufacturers to specify that wireless and Ethernet components can communicate seamlessly with other systems. An SDN for industrial network applications needs time to gestate and develop, hence its placement in the "> 2 years" time horizon. One of the critical items for this concept is the retention of network switch features that are optimized for industrial applications. To explain, one artifact of SDN in the data center application space is that companies sought to deploy "white label" switches in the architecture. The "white label" network switches are minimally viable products with very modest feature sets. These are completely appropriate choices for the data center implementation of SDN. However, it could be a stumbling block for industrial networks. Industrial network infrastructure is a valuable business asset. Investments in legacy industrial networks require a clear migration path to optimize return on assets while not missing out on performance enhancements from new technologies. A robust, well-executed physical layer is foundational to this asset, and continuing to deliver value. Rapidly emerging technology advances such as the Internet of Things, Wireless Sensor Networks, Power over Ethernet, and Time Sensitive Networking can further leverage your network with a little education and planning.